Remember the Edmarc Picnic I went to in June? 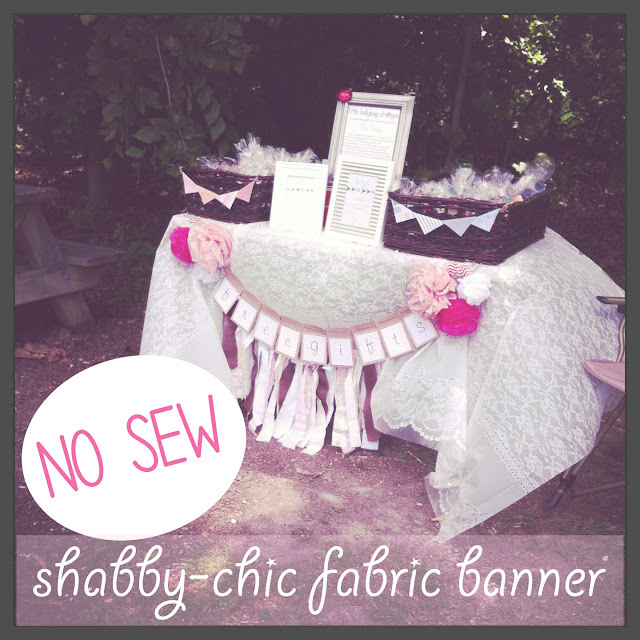 Well for my display table I made this really adorable shabby-chic fabric banner and wanted to post the DIY instructions. I think you'll be surprised at how simple it is! 1. Start with some twine (can be purchased at Wal-Mart in the craft section), cut to the length of the table (or other surface) you intend to decorate, plus about six inches to give you a little play in securing the sides. My table was 4 ft. (48 in.) long, so I cut a 54 in. piece of twine. 2. Tie the twine onto a workable area the same length as the surface you will be decorating. I used these chairs spaced out to the width of my 4 ft. table. 3. Begin cutting your fabric strips. I really used scraps from my fabric stash. I cut each strip about 2" wide and 22" long. Certainly you can adjust the width and length if the area you are decorating is larger. If I remember correctly, I used about six patterns and cut five strips of each. 4. Begin tying your strips onto the twine. There really is no secret, just play around with the knot so there is about 2 in. of fabric on the top and the rest drapes down. 5. If you're like me, you'll want to create a fairly repetitive pattern, so keep that in mind as you tie the strips on. The good thing is you can move the strips around to make room for new ones, so there are no permanent pattern errors! Since I needed to transport this banner, I tied loose knots right up next to the beginning and end fabric pieces so they wouldn't fall off. If no transporting is involved, you might be able to skip this step. Isn't it adorable!? And easy and really affordable, possibly even free depending on what supplies you already have on hand. Now you have another easy DIY project on hand that you can whip up for your next event. I wanted to add, the first time I saw one of these fabric banners was at my sweet Evie's Memorial Service. And, I still have it in her memory box. Maybe I will be brave enough to use it one day. At any rate, I hope you are able to make one of these sometime soon. And, if you do, please share pictures!